The field of medical sales is perfect if you’re interested in retail sales positions as well as the medical industry. Both the sales fields and medical fields are extremely stable, and offer excellent opportunities for growth. What Is a Medical Sales Representative? Advancement as a medical sales representative is usually based on both seniority and sales. A medical sales representative needs to be knowledgeable in both the areas of marketing sales and medical sales. Due to this, the field is ideal for those within both industries. Both the areas of marketing sales and medical sales can be extraordinarily complicated. Those that wish to navigate these complicated matters will often need to start their career early or acquire either a Bachelor’s Degree or Master’s Degree within the field. Medical programs have been highly lucrative for many years. The medical industry is one of the fastest growing industries throughout the world, and becoming a medical sales representative is an excellent way to take advantage of this growth without having to attend medical school or become a medical practitioner. Medical sales representatives can be extremely successful, especially as they build their client list and become respected among their peers. What Does a Medical Sales Representative Do? A medical sales representative usually needs to focus on networking. They need to build a list of physicians that trust their medications and will put it orders consistently. 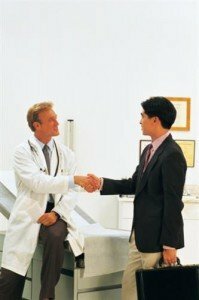 Medical sales representatives need to be very trustworthy and they need to be knowledgeable about their medications. This will often require studying information packets and working late hours. Networking can often be done through seminars and other medical gatherings. Medical sales representatives will usually start with a list a pharmaceutical company provides, but a sales representative may need to gather their own leads to progress further. While pharmaceutical sales is the largest focus for medical sales representatives, there are also other types of sales representative such as those that focus on medical equipment, needles and other important medical supplies. How Do You Become a Medical Sales Representative? A medical sales representative often needs to be licensed or otherwise credentialed. The National Association of Medical Sales Representatives offers training programs, as well as conferences and conventions for those interested in the industry or interested in growing their career. A medical sales representative should usually have a Bachelor’s Degree in a field related to medicine or sales, but it is not always required. A medical sales representative may also have experience in another sales field if they are interested in breaking into the medical sales business. Real estate sales, insurance sales and sales engineering are examples of successful careers a medical sales representative may have had in the past. Nevertheless, the sales representative will usually need to have moderate amounts of on-the-job training to truly excel at their career. They may need to work under another representative if they do not have prior experience in the medical industry. How Do You Advance as a Medical Sales Representative? Advancement as a medical sales representative is usually based on both seniority and sales. Medical representatives that want to get the most out of their career will want to increase the amount of sales they make and remain a consistently high performer. Those that want to advance even further may eventually become the head of a sales branch through proper networking channels and displays of leadership. Customer satisfaction is also very important, and those that can keep their physicians satisfied will often find greater levels of success. Those seeking a different type of career path can enter into related fields, which the Bureau of Labor Statistics reports as advertising sales agents, insurance sales agents and product promotion.